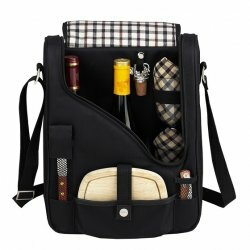 PIC434L, The insulated 2 bottle London Wine & Cheese tote bag is the ideal wine carrier kit for two. Made of 600D Polycanvas / Cotton. NOTE: Canvas wine tote comes in Black / London Plaid.